Welcome to Creative Cover Hire we are venue dressers with a difference. As a family run business with 30 years experience in the soft furnishings industry we understand how your event needs to create a lasting impression for you and your guests. Many of our design specialists have been with Creative Cover Hire since the very start and have seen the business grow to what it is today. Their specialist knowledge of how to dress venues is second to none and they will make your wedding or bespoke event a day to remember. That vision may include our beautiful tailor made Wedding chair covers and sashes, chiavari chairs, fairy light backdrops, stunning ceiling drapes, pristine linen, table runners, aisle carpets, table accessories, the list goes on! Our specialist team will take you through the variety of options available to you and help your ideas become a reality. With a blend of artistry, expertise and experience, the Creative Cover Hire design team will ensure that your event goes to plan. On the day of your event we will travel to your venue and make sure that everything is in place and that the finished result is perfect. We will be on hand to answer any questions you may have and to make sure that your event lives up to your expectations and delivers a memorable day for you and your guests. Based in Preston, Lancashire we cover the whole of the North of England, including Cheshire, Cumbria, Greater Manchester, North Wales and parts of the Midlands. We also cover the whole of Lancashire including Chorley, Blackpool, Preston and Burnley. We are renowned for dressing venues that will live long in the memory and our eye for detail has made us one of the leading venue dressing companies in the country, setting trends that others follow. 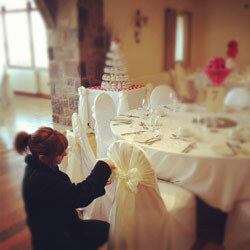 Using Creative Cover Hire to dress your venue will make all the difference! Meet Dawn, our Managing Director.